Recycled Stereo Plus: Marantz 2270 Receiver - $1000.00 Excellent Fully Working Condition! 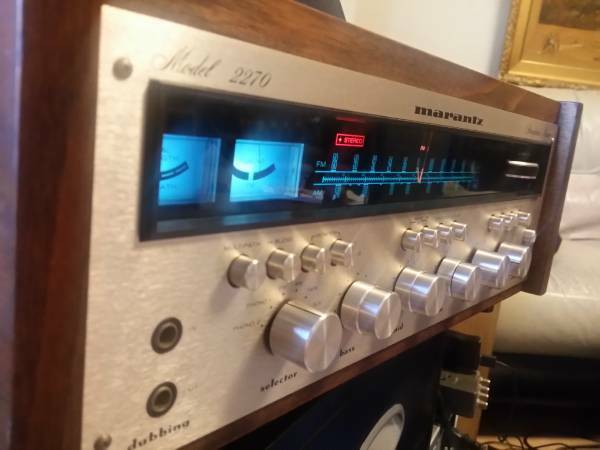 Marantz 2270 Receiver - $1000.00 Excellent Fully Working Condition! Marantz 2270 Receiver - $1000.00 Excellent Fully Working Condition. It is in Excellent working condition with clean/Powerful sound. This is a classic high quality vintage 1970's MARANTZ 2270 stereo receiver that may be one of the finest of the vintage Marantz receivers. These vintage receivers are known for their high quality sound and excellent build quality. The vintage Marantz receivers have the silver brushed aluminum faceplate with metal knobs, large blue lighted tuning scale, and wood look vinyl veneer metal cabinet. The receiver has been serviced and had all controls and switches cleaned and lubricated. It has been thoroughly cleaned and detailed and the faceplate & knobs were hand polished. 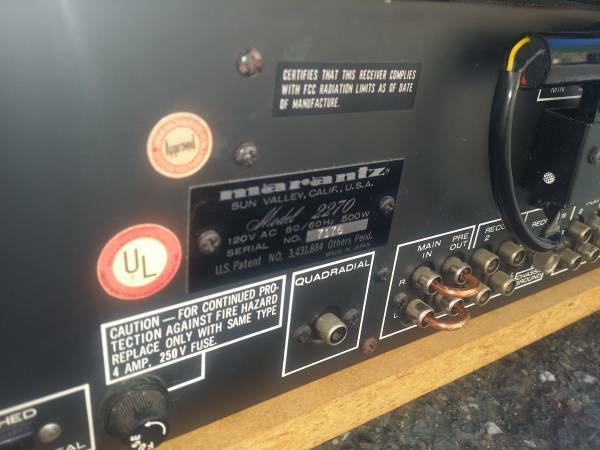 The amplifier section was checked and is in excellent working condition and the DC offset was checked and adjusted as well as the idle current. Power output is a strong 70 Watts per Channel which is underrated and this is a great receiver to connect a Phono turntable, CD player or an IPOD with adapter RCA connects or listen to the AM/FM stereo radio. The receiver has a high quality AM-FM tuning radio section with Gyro-Touch Tuning and the radio section is in excellent working condition. The receiver has Treble, Midrange, & Bass control and a Loudness switch to boost frequency range at low volume levels. There are inputs for 2- Phonos, Tape 1, Tape 2, and AUX and the Tape and AUX inputs can also be used for CD or DVD analog or the IPOD connect. There are Inputs for Main AMP IN and Preamp Out so these sections can be used independently if desired. The 2270 receiver can handle down to 4 Ohm speakers so a wide variety of speakers can be used. Two pairs of speakers can be connected with an 8 Ohm minimum per pair.